It wasn’t dark, it wasn’t stormy. It never was stormy in MoonClan’s territory. The sky wasn’t dark, though the cats who shared the small dense thicket also shared a feeling of opaque darkness. The cat who seemed the eldest took a step forward. His companions looked at the tom, half scared, half excited. Another she-cat with black fur and dark blue eyes yowled protest; “Let the young one speak! His point is more valid than any other tonight.” Every cat but four bowed its head, for the speaker had been one of the five great leaders in the beginning. Her name was Shade, though she like the other great leaders had added ‘Moon’ to the end in respect for their ancestors and the fifth leader, Moon. A pure white she cat with matching eyes stood and looked upon the others as the leader of all of them. Her long whiskers twitched slightly in thought. She spread silence simply with a gaze of those milky eyes. “Accepted, grudgingly,” was meowed in perfect unison from the other four great leaders. “I present the strongest kits. They shall be given the powers of ShadeClan. Their qualities are thoughtfulness and endurance.” Shade yowled upward to the blank, bright sky. Moon bowed her head. “I present the fastest kits. They shall be given the powers of ReedClan. Their qualities are swiftness and creativity.” A thin blue-grey tom yowled, though his was proclamation directed to the cats in the thicket. "I present the most loving kits. They shall be given the powers of MagmaClan. Their qualities are strength and passion.” The ginger tortoiseshell meowed. “I present, then, the kindest kits. They shall be given the powers of MoonClan. Their qualities are serenity and forgiveness.” Moon bowed her head in the direction of a silver tom. He squirmed in her gaze, looking uncomfortable. “I have no descendants to present. My bloodline died out seasons ago.” He mewed into his chest fur. “That is a problem… maybe you can… have kits with a living queen?” Magma asked. “That wouldn’t work, mouse-brain.” Shade batted the ginger tortoiseshell playfully across the ears. Moon thought for a moment, twitching her whiskers. It was a long time before she spoke, “Eternity, I can think of only one option if you wish to take part in this effort to save your Clan. You must create two kits from your own essence.” Eternity thought for a very long time. His tail subconsciously swished out the seconds. He slowly nodded. Finally, he mewed, “Sounds fine. 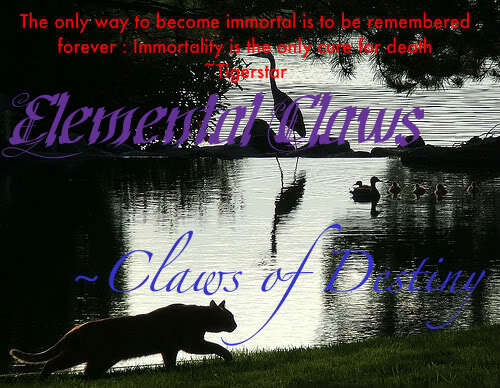 Then I will call them Dawnkit and Destinykit, they will inherit the powers of EternityClan. Their qualities will not be chosen by me, but by them. They will reflect what good she sees in others.” Moon nodded.